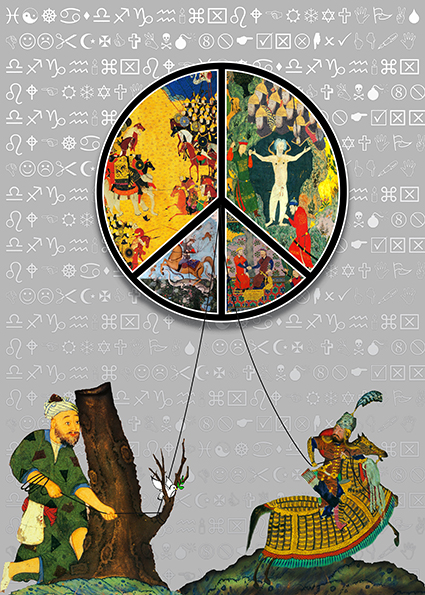 Re-purposing classical Persian art, this utilizes depictions of peace and war within the peace symbol and shows a peace-maker and general tugging over the peace symbol. The background incorporates various symbols for religious, emotions, danger, and peace. 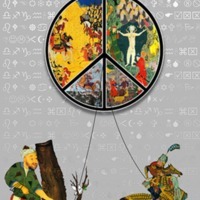 Shamim Bakhshizade, “untitled,” Peace Posters Dialogue Project, accessed April 23, 2019, http://peaceposters.oberlincollegelibrary.org/items/show/354.